As usual, in #7 of the Davis Way Crime Spree series, we find a funny, and wild at time unbelievable, entertaining story. Opening her door expecting to see her sister, Meredith she found Vreeland Howard. All morning waiting for sister to show up. Meredith is a no-show. However, Bootsy Howard appears and tell her that in order to see her sister and Vree’s dog she must pay a million dollars, Pastor Gully. At this point, the tale takes so many turns you are flipping the pages as fast you can. Davis has no way of finding a million dollars and her efforts to find the money without stealing it from the conduct will amuse you. Yes, the twins and dogs are in attendance, Bradley is not. Did Davis succeed? Read the book to find out why and how. I highly recommend this book and series. Disclosure: Many thanks to Henery Press for a copy of this book for review. The opinions expressed are my own. 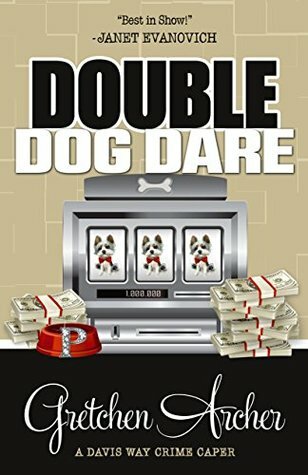 This entry was posted in #NetGalley, Books, Uncategorized and tagged Casino, cozy mystery, Davis, Dog, Favorite, funny, Gretchen Archer. Bookmark the permalink. I just came across book 1 of this series. I know you like the Henery Press books and was going to ask if you’d read it. Guess you did. and good to know you recommend it. Okay. I had gotten an email with a sale price of 99 cents for book one in that series. Will look at the Susan Boyer too.